Context: Picked this up in an apartment with a view of the Bernese Alps where we stayed in Switzerland. Norman Grubb is a bit of a legend. He spent his latter years writing Christian biographies despite having live a life that was more than equally worthy of an autobiography. This was his first and it was about his father in law. The book was written in 1933 and, as Grubb’s first, showed his immaturity as writer. Good thing the subject matter is more than worth the read then. There are long passages of direct quotes from Studd’s material and the book also includes less than riveting stats on Studd’s cricketing career which may not appeal to many. 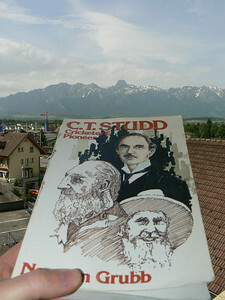 But CT Studd, founder of the missionary giant WEC, had an amazing life and was definitely worthy of a biography. Despite being married to his daughter, Grubb seemed to keep a good balance of praise for Studd’s worthy exploits with reserved criticism for some of his more extreme beliefs, particularly those which led to difficulties with other workers. These though are worth reading about because little has changed on the mission field in terms of personal relationship and the kinds of things that still put barriers between people working together. As my wife and I are preparing to join this fold later in the year, it was an interesting read for me. While the long quotes from Studd’s own material might not read too well, there are some real gems of encouragement in there and I felt challenged to a deeper commitment to Christ. This alone makes it worth the read but it won’t make Arukiyomi’s 1001 Christian Books to Read Before You Die list! I shall add it to my growing list of books to get on and read.